Daemonic kitties are harbingers of doom and badly-lit images. 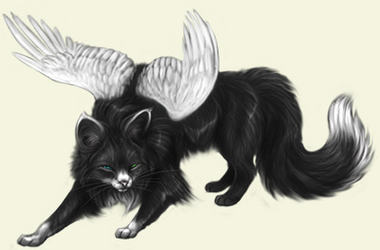 Daemonic kitties (Felis daemonius), also known as demonic kitties, winged cats, dresthinas, dragon cats, Mr. Thompson, you're hallucinating again, and Mr. Scruffy, where are you? Your dinner's getting cold!, are dark and evil beings. Neither fully cat nor fully something else, there has been much speculation as to just what that something else might be, or as much speculation as any normal human can achieve before succumbing to either their overwhelming cuteness, or if that fails, to powerful allergies. Either way, there is a subsequent loss of interest in continuing higher brain functions. Most daemonic kitties resemble ordinary cats, at least on some level. Some are completely indistinguishable from the average housecat; some scientists theorise that housecats may simply be another variety of daemonic kitty, as most housecats classified as such tend to forget that they are supposedly daemonic, and it would also fit - what daemonic kitties desire above all else is power... or at very least that their every desire is pandered to, and housecats have it all. Other breeds, however, have a harder time as they look decidedly less mundane, sometimes sporting wings, tentacles, excess tails, or even an alarmingly lacking number of heads, though they usually make up for that by keeping their teeth elsewhere. Others are just plain strange, but as these tend to be mistaken for sea creatures and/or fungi as much as anything else, they are also much less classified. Proper precautions must be taken when dealing with daemonic kitties. Regardless of what they are biologically, or to whom the research funding changes hands, one thing is clear. Daemonic kitties, dresthinas, hallucinatory apparitions, house-broken moose, no matter the name, are evil. Very, very evil. Everything they do supports this - be it holding their 'masters' captive, holding random passerby captive, holding banks hostage and demanding food or holding supermarkets hostage and demanding money, or even doing things not involving holding people captive. Regardless of what they are doing, this evil will extend even to the point where the very idea of doing something good becomes sickening to them. 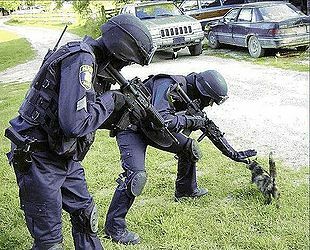 Most daemonic kitties stick to more classical forms of evil, those of terror and oppression, hence why holding hostages and captives is so popular, even becoming iconic of the cats, but the odd subversive prank is not uncommon as well. Such pranks serve to turn others, the so-called 'good', against each other or against themselves, creating general dissonance or perhaps casting doubts on perceived right and wrong and even on reality itself. Should this occur, psychotropic drugs often come into the picture and targets become even more receptive. Other behaviour can be much less predictable - a cat sliming into oncoming traffic and up-ending lorries; a litter of kittens spontaneously bursting into flame and burning down the flat along with everyone in it, including those who would otherwise have cared for them; an innocuous-looking tabby eating all of the household appliances and then regurgitating them on the lawn - but all of it is evil. Simply evil. Recent scientific advances have finally cast some light on their dark and evil nature. While the specific traits of daemonic kitties tend to be quite varied, some commonalities are to be observed, and thus each cat may be categorised into more specific types. Not exactly breeds in that the traits appear to in no way be genetic, these types also tend to overlap considerably and range from catch-all to 'that cat over there'. The most general types are as follows: Normal, Daemonic, and Wait, is that a cat or a fungal growth? as that is about all anyone can agree upon; anything beyond this has proven excessively taxing for the self-declared experts, who have likewise been unable to agree on what the 'cats' even are. As dark and evil beings, daemonic kitties differ greatly from other felidae; it is argued that they do not, in fact, belong in the family at all, and that their resemblance to other members is just that - resemblance. As such, various theories have been put forward as how they should truly be classified, for this classification is of the utmost importance; without it it would be impossible to identify just what things are and whether the large furry animal dominating the sofa is really technically a cat or a moose. Typical of a daemonic kitty, this cat is perfectly ordinary if one can look past his slightly extraordinary aspects. As with any critter considered 'cute', it is little wonder that these cats have proven themselves thoroughly evil and have, throughout the ages, come to be referred to as 'demons'. Worming their way into the hearts and homes of many, eating their keepers' food, shredding their keepers' furniture and shedding fur, scales and feathers alike on every available surface, they are parasites upon civilisation, and yet people welcome them even as they spread sickness and doom. This, along with how bloody unnatural the creatures can be, only feeds the paranoia and speculation of those who happen to be paranoid and speculate about such things. 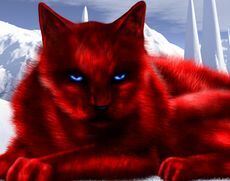 And demonic or otherwise, the cats are unlike any other animals (or anything else found in nature, for that matter) - unnatural is indeed a term for it. Barring the entrance of extraterrestrials, nothing else can produce viable offspring of such variety in a single litter, with perhaps a head or two of ordinary kittens mixed in with more birdlike young and a three-headed sphinx-like child already with a grasp of basic French only days after birth... as well as a sibling with evidently no bone structure that, instead of dying like any decent bone-lacking vertebrate should, starts oozing around the room leaving a trail of slime, all the while purring and as happy as can be. Mutations do not cover it; this happens with every litter, all shapes and sizes and colours and forms, with child traits seemingly irrelevant of those of the parents. It is not normal, nor are their body temperatures or personalities or eating habits. While one will eat only metals, another will not eat at all and another still will eat everything in reach and then digest none of it, merely sit there, weighed down by the toasters in its stomach. Some so-called 'daemonic' cats resemble some modern depictions of dragons. As such, according to some, usually those not actually in proximity to the cats themselves, the evidence is clear - there must be a relation. Following typical palaeontological practice, putting forth the theory that these 'cats' are really creatures descended from dragons required only that one find some vaguely-related evidence, in this case an early bird skeleton, and have an epiphany. What followed was paper after paper based upon this bird, all of which which took the liberty of conveniently forgetting minor details, such as that cats are mammals and birds are not. Outright questioning of such is rare, however, because everyone knows people who publish papers are smart. The more papers, the smarter they are, and smart is right. There also remains the unfortunate snag in which dragons do not technically exist, but that also tends to remain conveniently forgotten. An explanation that is particularly popular with certain doctors as well as the pharmaceutical industry as a whole is that so-called 'daemonic kitties' do not exist at all, as such. 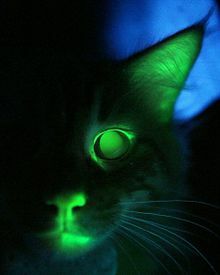 Ordinary cats in reality, their daemonic aspects are merely hallucinations brought on by the usage of powerful drugs, probably prescribed for some other ailment, and if the patient is having such powerful hallucinations as a side effect, it might be wise to prescribe him something for that as well. 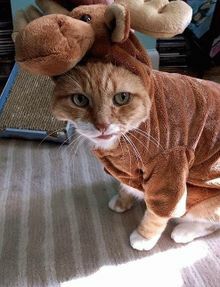 That is no costume; this 'cat' really is a moose. For lack of any more sensible explanation, there are some who put forward that daemonic kitties are not cats at all, but are instead a small variety of moose, except on the occasions on which they're larger than most moose, in which case they are instead a large variety of moose. 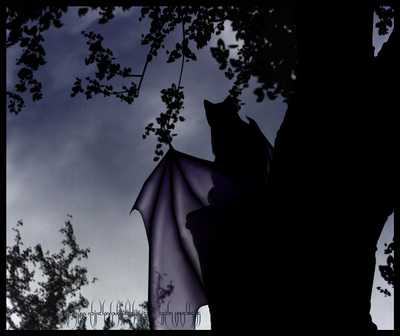 Especially popular amongst those who particularly dislike the idea of calling living beings 'daemons' because they have rights too, this approach to the creatures builds off the cats' strangeness as well as the stupidity of the folks' peers. 'Well, do you have a better explanation?' and 'Can you prove it's not a moose? Well, can you?' are common arguments, and indeed true stumpers for those on whom they are used. The cats themselves, or as some would say, the moose themselves, are naturally completely ambivalent about this so long as they are still properly fed. For those that eat weeds, shrubs, fruits and other typical moose foods, it is a perfectly dandy arrangement, at least until some hunter finds them or another moose tries to mate with them. Ones that subsist more off cardboard and other garbage materials have a little harder a time, as many human cities do not particularly appreciate having moose within their limits, even when all the creatures do is walk down the sidewalks (following proper pedestrian guidelines, no less) and eat some recycling.